We recently received information from Dr Ken Vincent about his article on the Rubaiyat. This is written from the perspective of research into religious/spiritual/mystical experience. Ken’s approach to Khayyam is made clear from the first paragraphs of the article. 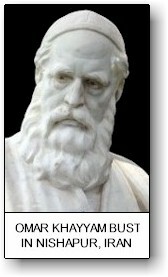 Omar Khayyám is one of my heroes. I have read translations of his poem, the Rubaiyat, hundreds of times over the past 50 years. Amazingly, each repetition still brings some fresh insight! Rubai means “quatrain,” a four-line stanza in which there are two sets of rhyming lines. The Rubaiyat is a collection of quatrains written over a period of many years by Omar Khayyám, a Sufi mystic living in the late 11th and early 12th Centuries. Within Omar’s poetry, I recognize a person much like myself: someone unable to be an orthodox believer but too optimistic to be agnostic! His verses reflect the impossibility of certainty in religion, philosophy, or science; he questions the theological tenants of all religions. Ultimately, he was simply a lover of God. He believed his own mystical experiences which became the basis of his faith. The full text of this interesting interpretation of Khayyam and the Rubaiyat can be found via the link https://www.near-death.com/religion/god-is-with-us/omar-khayyam-sufi-universalist.html . The article covers the position of Khayyam as poet, polymath, cosmologist, panentheist, Sufi universalist and more. Ken’s argument is illustrated by quotations from Whinfield’s English translation, which he prefers because of its closeness to the meaning of the poems. The article is a chapter in a book entitled God is with us. Dr Ken Vincent is a former teacher of Psychology and the Psychology of Religious Experience. He served as a founding Board member of the Christian Universalist Association and is the former webmaster of the Universalist Herald website.